2017 Valleyridge Farm Enterprises Ltd.
A Rotary Club That Makes Money! The Rotary Club of Simcoe, Ontario, Canada makes money as well as fundraises to obtain money! 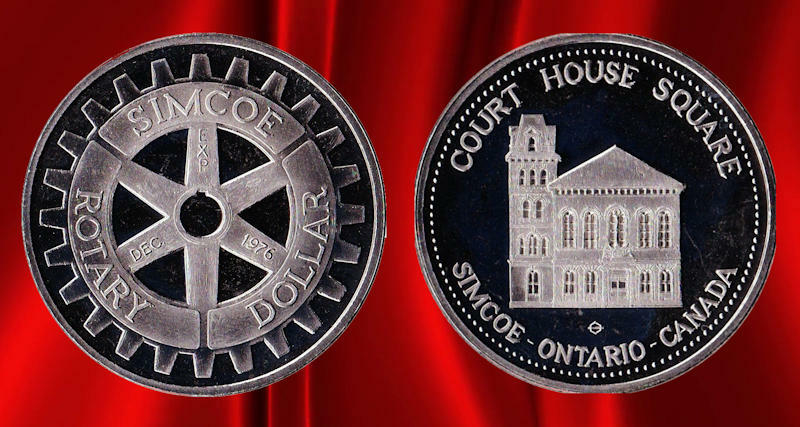 Technically, the Simcoe Rotary Dollar which is made of nickel is a token. The face of the "coin" contains the Rotary International logo and the Simcoe Rotary Dollar description and the date "DEC, 1976". It is believed that the EXP may refer to the foundry where they were made. On the reverse side, you see "COURT HOUSE SQUARE", Simcoe, Ontario, Canada and a registration mark of some kind. Governor Simcoe Square in downtown Simcoe was an unique collection of old, mostly vacant historic buildings in the early 1970's, namely the Norfolk County Courthouse, and adjacent Goal where condemned men have been hanged as well as the former Land Registry office and a small building. In the 1970's, the Town of Simcoe purchased from the County of Norfolk what was to become Governor Simcoe Square and renovated the Courthouse into the Town Hall and the Goal into a Public Library. The other two buildings fronting on Colborne Street South were use for offices and storage. A number of Rotarians became proponents of the restoration when it was proposed to demolish the old buildings. Their prominent and forceful involvement in the "Save The Courthouse" campaign contributed to its success. This important preservation and reuse of old and historic buildings lead to other downtown restorations such as the old Farmers Market and Firehall building as well as the old Armories. In the mid 1970's, the Rotary Dollar was borne as a way for the Club to increase it's revenues. There were stories of one of our Rotarians storing several canvas sacks of the coins in his garage. Today it is highly unlikely that there is a sizable stash waiting to be discovered in local Rotarians dwellings. Although our long term members will admit to possessing the "coins". Wait until they find out how much the "coins" are worth 43 years later. A search of the Internet yields a number of these "coins" for sale by individuals in North America selling collectibles and by numismatists. You can be the proud owner of a Simcoe Rotary Dollar for $ 8.93 Canadian. This sale just took place recently on E-Bay. Shipping and taxes are extra. Rotarians take note! 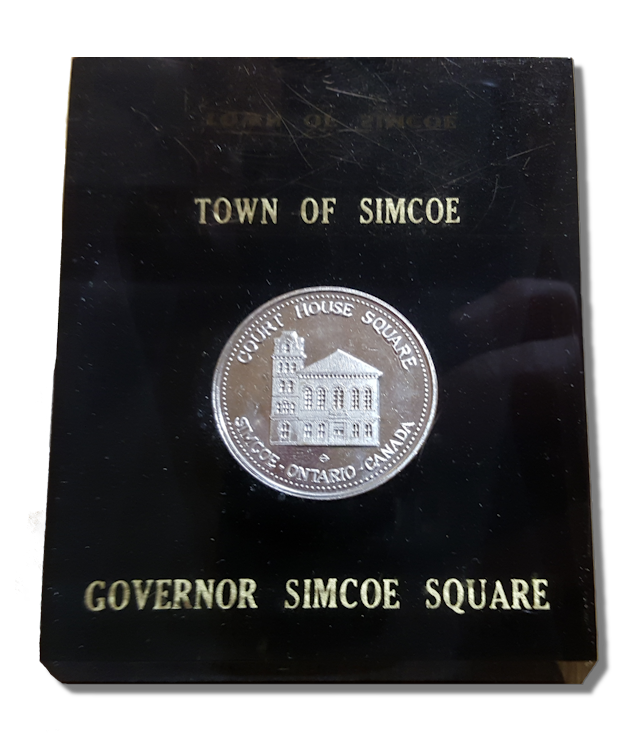 Later in the 1980's, the surplus "coins" were incorporated into Town of Simcoe paperweights and were gifted to VIP's and other worthy persons. It is not known how many of the paperweights were made and when the Town of Simcoe stopped distributing them. If you are a collector, there was a limited amount of them made and technically the Municipality of the Town of Simcoe has ceased to exist. The Province of Ontario amalgamated at number of local municipalities such as the Town of Simcoe into the County of Norfolk. Perhaps this would make them a valuable collectible? The County of Norfolk is headquartered in Governor Simcoe Square. If you are a historian, it must strike you as a little "ironic" that the County of Norfolk once more owns the Square. 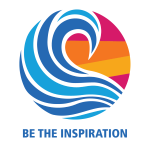 Improving Local and Global Communities through enthusiastic Service Above Self.